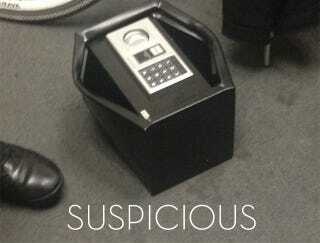 A package arrived at the offices of Ninemsn yesterday, containing a letter and a small safe. Media industry site Mumbrella reports that the letter told the addressee to check their voicemail, only that reporter didn't have a new voicemail. When they then punched a pin code into the safe, the safe started beeping. Growing slightly concerned it might be an explosive device, Ninemsn started calling other newsrooms to see if they'd gotten a similar package. "This is definitely the other side of the line in terms of what it's safe for a PR company to send anonymously to a newsroom", Ninemsn's Hal Crawford told Mumbrella. "The thing was black, heavy and slightly creepy. "We did check with other newsrooms to see if they had received a similar package as we thought it was a PR stunt, but no-one else had. We weren't panicked at any point, but given there was no note explaining what it was, we had to take sensible precautions." That meant evacuating some staff and calling the bomb squad, who opened the safe (you can see it pried open up top) to find...a copy of Watch Dogs, a baseball/iconic cap and a beanie.